Dr. Segler: I’m here today at A Runner’s Mind which is my favorite running shoes store on the Peninsula by a mile and we’re talking with Dawson Alexander about plantar fasciitis and all the different things that runners need to understand about plantar fasciitis in terms of the condition itself, running, running shoes and other things that can be helpful when you either have had plantar fasciitis and don’t want to get it again, or you think you have it currently and are making sure that you’re going to get better and continue running. Dawson thanks for doing this and letting us come here and talk to you about all the different things runners can do. In brief my take on plantar fasciitis is that plantar fasciitis is the most common condition for sure that people seek treatment for. In fact, it’s about 40 percent of all visits to podiatrists in United States certainly. It affects most runners at some point to some degree. We hear all kinds of things about it. There a lot of people will just say it’s just self-limiting. That maybe true for some people but if you’re really actively training I don’t think that is normally true. You can continue to run. I believe most runners can continue to run when they have plantar fasciitis but it’s definitely an irritating condition. What I see more than anything else is that runners become hesitant when they get it, right? They get it and they don’t really know if they can run. They don’t really know if they should continue to train. A lot of us will kind of half-train, which is not really gratifying. It doesn’t really help us achieve our goals. Then maybe we do a race at sub-optimal performance and we still have we have this thing in the back of our mind that keeps telling us we have this problem. So, I would imagine you have lots of people coming here that say they have plantar fasciitis; they have heel pain, arch pain or something. Is that a common condition that you see from runners? Dawson Alexander: Incredibly so, a lot of the athletes that come into the shops are often times complaining of heel pain, arch pain and usually either self-diagnosis or they have a doctor’s diagnosis of what’s going on and they are seeking advice in terms of treatment. They want to know whether or not they are going to continue training or if it’s more conducive to take a step back from training to allow the area to heal. At our shop we really truly believe in proper treatments so you can continue to run, albeit perhaps a very moderated amount until you are able to get back to running completely. So active rehab is kind of a tool that we use to look at the footwear; identifying mechanics whether they’re running on their proper services or they need to switch it up a little bit, or maybe they need some stretching foam rolling. So there are a few different areas that we look at to understand what the impact is in the area and what’s the best troubleshooting solutions going to be and we can then take it from there. We see this scenario literally everyday. Dr. Segler: Well that’s just it right? So most doctors do see it everyday, too. So, maybe what we can do is we can talk a little bit about what patients seem to describe as the problem. Because my perspective is probably different than yours. People come to me when they think they have it for a really long time or they’re really frustrated or they tried some of these things on their own and they just not getting any better. But I imagine your experience with runners with plantar fasciitis here in the store different. So what do you hear from patients when they suspect their plantar fasciitis is causing the problem, What in your mind is it that clues somebody that they have plantar fasciitis as a problem. Dawson Alexander: The big one for us is when the individual wakes up in the morning and the first step they take is really painful. The foot is unable to flex or bend with that first step out of bed and it is very painful as scar tissues starts to break up. You feel like there is tension there. You kind of warm up the foot before you can walk without pain. When you’re sleeping at night and those areas are try to heal, taking that first step can be really painful. That painful step in the morning is what clues us in quite a bit that plantar fasciitis may be the problem. 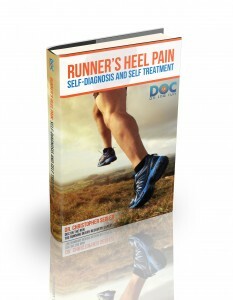 But when they are running they don’t necessarily feel the heel pain during the run. But post run they’ll feel that pain, that pressure through the arch and the heel could. It can even be intense pain. Sometimes they experience heel pain through the run, after their long, after they have been walking around or standing all day long or standing on their feet all day long. Often they are feeling that severe pain that’s sometimes a dull achy pain. Often times it’s a sharp pain either in the heel or in the arch. We start to think it is something like plantar fasciitis. Dr. Segler: That’s an important point because in the book that I wrote on heel pain, I talked about all the different conditions that people confuse with plantar fasciitis. And there are lots of different ones. If someone has a stress fracture of the heel bone obviously, that would be a really concerning thing because the heel bone could break apart and ruin your ability to run forever. But a stress fracture has very different symptoms right? So some might get a stress fracture in the heel bone. But unlike plantar fasciitis, it does usually hurt when you’re running because you are pounding and stressing it every time you land. It hurts more and more and more. Plantar fasciitis hurts in the morning for a specific reason. You have two things going on. The first is that you have fluid accumulated around the bottom of the heel that is trying to fix all the damage to the fascia. While you are sleeping that’s part of the inflammatory process. Then you also have little collagen fibers starting to heal the plantar fasciitis at the bottom of your foot. But when you get up and step out of your bed, you basically squish the nerve on the bottom of the heel with all the fluid that’s accumulating there. And that step causes a really sharp pain. As you suddenly load the plantar fascia and apply tension to it, it hurts. So, as you said that step out of bed kind of breaks up that scar tissue that’s trying to heal the injury and it hurts in the initial step. However most people start walking and they gets better. That’s part of the reason why it doesn’t hurt as much as you run. When you’re running it may hurt. If you drive to a specific place to run it might hurt when you get out the car and take the first couple of steps the same as after you’ve been asleep. But then when you start running everything’s kind of supple and it doesn’t really hurt that much. You don’t notice that much when you’re running. But like you said at the end of the day you know it’s been irritated because you’re really stressed the fascia during the run. Then it does hurt later that day, or certainly more the next day after that run. Patients want to do something about that because the heel pain annoying. But it’s confusing because it’s not hurting while you’re doing the actual activity that may be delaying the healing or contributing to the lack of healing that’s been happening. street, they’re running on a slope and the right foot is forcibly pronating and increasing the stress on the plantar fasciitis. If that same person were to run at the opposite side of the street with their back to traffic then it might not happen that way. It might not stress the plantar fascia. Does that make sense? Dawson Alexander: I know it absolutely make sense, so if you are running on a banked surface that can cause increased pressure, increase tension on that one singular side which can disrupt your gait pattern which can put things off and create a little more bit impact that way. There’s more tension on the fascia. 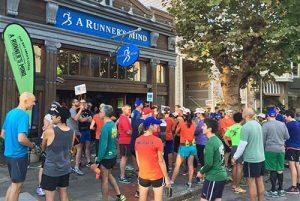 When the athlete comes into the A Runner’s Mind store whether they’re a walker, runner, or just fitness enthusiast, we have to understand sort of the circumstances that they’re training. We have to know if they are uneven surfaces, if it is a banked surface. We talk about the areas where they run. We also have to determine whether or not if there is any type of muscular imbalances…that’s another key area we look into it. So it’s looking at their history as an athlete and train activities to get a better idea or understanding of where they’re coming from. It matters right? So what are the places around here in Burlingame that you seem to talk to people and they say well, I always run on the jogging path in this park. And then do you run on the pavement part? Or do you run on the gravel part on the side of the paved path? What are the popular running locations? Where is it that people run around here that may or may not really contribute to plantar fasciitis as a problem? Dawson Alexander: Around in this area in Burlingame there are a lot of banked streets or areas that don’t have sidewalks. Many of the running paths are unpaved or really uneven and so, we try to isolate and identify those areas because as runners and athletes of this area, we know these spots, we know exactly what it looks like if they are running on a canted or banked surface it is different. And if it’s is a hilly course they run on, we want to know how far their incline goes. 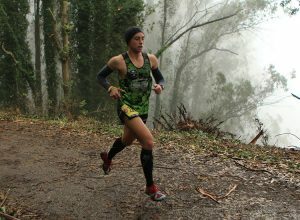 Or if they run at Sawyer Camp which is a local running spot right on the Crystal Springs Reservoir we know certain areas of that is a little bit banked. And in cases we need to think about how steep the hills are. If they’re running on just one side of that pavement day in and day out that’s going to caused overuse areas so we try to identify the surfaces that can affect a basic runner’s biomechanics and running form. Dr. Segler: Exactly. Because at Sawyer Camp for example if people start at the southern and end of the jogging trail they can go about 7 miles round trip and its basically flat right? I mean there some severe banks around a couples of corners but they’re very short lived. And it is basically symmetric if you go out and back. But if you run 10 miles then you have to go uphill all the way to the dam which is a significant climb by a flat running standards. That’s a big hill right? Even by San Francisco standards that’s a pretty long climb. So it’s tough and most people do something like 10 miles and go up that thing and then back down and that’s pretty hard on the body. If they just go up a really steep hill and then turn around and run back down that can be a lot of stress. So it is important to understand the surfaces and note that running uphill and downhill is more force. Running on banked surfaces is more force. You have to evaluate the contributions of the running surfaces right? So that’s obviously one thing you can do is you can look at the ground underneath you and try to figure out. Is the surface that you’re running is contributing? But then also, what’s between you and the ground? That would be shoes and insoles that kind of thing. That’s yet another consideration. In terms of somebody that has for example an unstable flat, and they try a shoe like the Brooks Beast. it’s really, really, really stable shoe. A shoe like that can really help control some of that pronation right? Dawson Alexander: Certainly when we have a hypermobile foot type meaning of foot that has a lot of excessive motion one way or the other, more often we see that the foot collapses. When we see that the foot has a significant loss of arch height that’s what we call over pronation. That can be difficult to work with because often times that foot is a little hypermobile, it’s hard to control through the gait process. In that case there’s a lot of more forces applied depending on how far your running, or what part of surface you are running on. So something more stable designed to reduce the amount of overall motion in the foot. The shoe is capturing and guiding the foot a little better, a little more efficiently. It’s all about absorbing impact a little more even and efficiently. So some runners need to control that overpronation as much as possible. In that case shoes like the Beast can help. But there are other shoes that control pronation. So depending upon the runner’s foot-type, a pronation-control shoe within the same range or guidelines can help structure and stabilize the foot, so you can find it decreases the pressure. Increasing stability helps as well. they do change the last occasionally, which alters the way the shoe fits my foot. How do you decide when somebody has an unstable hypermobile foot? What do you really look at to determine which shoe is best for that runner in terms of pronation control shoe. 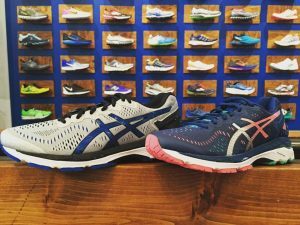 Which is the best running shoe for that particular runner? How do you decide that? Dawson Alexander: Well in the shop were all professional trained and conduct on what we call gait analysis. We do basic measurements of the foot type to see the shape, the overall arch type, and the length. We watch them walk, we watch them run, and based on those alignments metrics we understand and how the foot fits with every brand. Because every brand will make a stability shoe, but absolutely they all vary in terms of overall fit and function when they run. So you need to understand the overall foot shape structure mechanics. We identify what type of shoes can align closest to that foot. 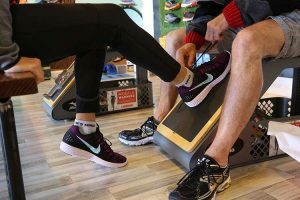 You may have one brand like Asics or Mizuno that comes highly recommended, as well as other brands too, but if that particular shoe brand doesn’t fit the shape of your foot then obviously we can’t put you in that shoe. Instead we will look at the mechanics and the shape of your foot. Once we identify the runner’s foot shape we look at that foot structure to offer the appropriate amount of support for the foot. But it is not a given brand necessarily. Dr. Segler: Well that brings up an important point. One of the things I admit is I hate to shop. I don’t like shopping at all for anything. In fact, even when I buy car I know exactly what I want and I find it online, and I’d go searching for it and decide I want that one, this is what I want to pay and that’s it. I don’t want to go shopping, I don’t like it. That’s just me. However, even though I hate shopping, I never buy running shoes by buying them from Zappos or Amazon. Now, I will tell you virtually all I buy nearly all my other shoes that way, But I only walk in dress shoes and casual shoes. I see patients in dress shoes. I don’t run in them. It doesn’t matter how supportive my dress shoes are. It’s not that important so, you know if they fit me a little bit off and I am lecturing at some medical conference, it doesn’t really matter. But I wouldn’t go run 10 miles in in dress shoes. is different. If you have a hypermobile foot that’s just one part of the equation. There’s the width of your foot. There’s the structure of your foot. And that foot is going to fit better in one running shoe than another. You have to also look at how wide your heel is and what brand fits best. And certainly Dawson knows better than me. Which shoe? Which manufacturer? Which category of shoe is going to better best for you? 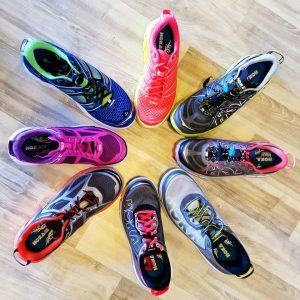 You certainly have to have all of these answers before you can get the right running shoe when you order online. Now if you decided that one shoe works, then okay great! I guess, but you don’t really get any of the input from people who are experts on shoes when you buy online. I can also tell you that running shoes change. What changed this season? And it does change every season? I remember very, very clearly in 2006 when Asics changed the last on Gel-Nimbus. That was a real bummer for me, because they were the perfect shoe for me up until that time and then they change them. But actually, shoe manufacturers change designs all the time right? It’s an ongoing process to them. They are always evaluating the shoes and trying to make them better. The problem is, they are always better for somebody and always worse for somebody else. So you have to like get that expert input. You have to make sure you are getting the best shoes for your running style. It’s not just a straightforward thing. You can’t just say, “I like blue” and expect to get the best shoe based on your color choice. That’s the main thing. 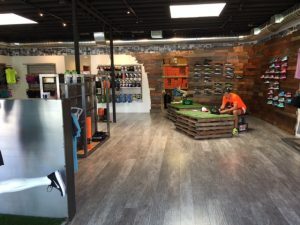 All running shoes stores are not created equal is the main point. In virtually every city of America there is a great running shoe store. 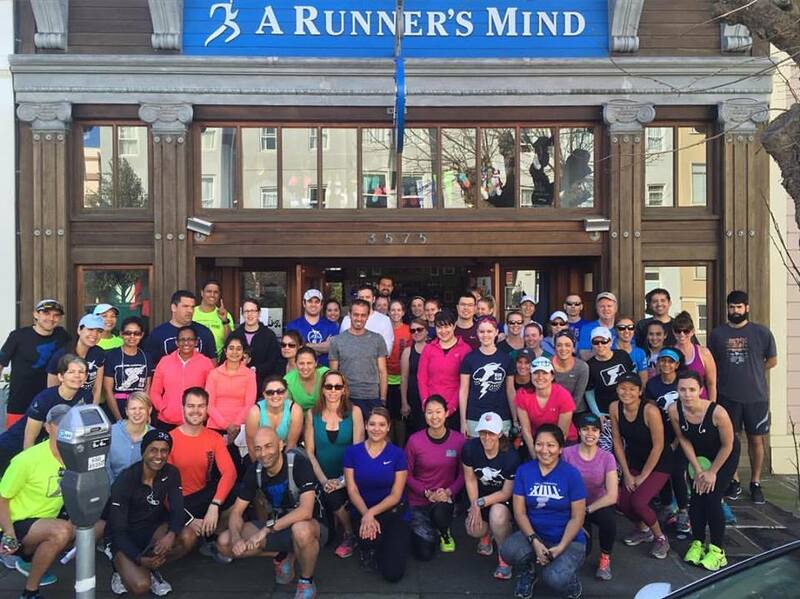 Personally I believe that A Runner’s Mind is the best one in the San Francisco Bay Area. They’ve got a number of locations, but they’re everywhere. If you’re in Washington DC, there are really good running shoe stores. I know, because I’ve been there once. I was going to medical conference and I visited shoe store and they’re really good and the people knew what they’re talking about, they didn’t just say, “oh, well, you pronate so you need pronation control shoes.” Because again that’s not the whole story. So thanks for that, that’s a good explanation. Dawson Alexander: We do a whole video gait analysis. At the shop (A Runner’s Mind) everyone is professionally trained to conduct gait analysis. 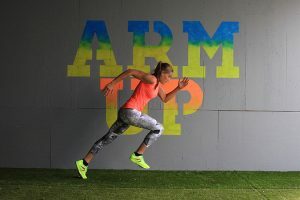 What that means, for an athlete coming in, whether they are a walker, a runner, or they just like to do general cross-training in the gym or crossfit, or whatever activity that he is. We ask them those important questions. What is it that you’re seeking to do with your shoes? What kind of training are you doing? What are the surfaces that your training on? We want the history of that athlete and if there’s any problems or injuries, pains, discomforts, they might be currently experiencing that’s really important to understand as well. That way we can present some troubleshooting options or solutions and make sure the shoes are appropriate and will help treat whatever symptoms that they may be experiencing. Once we break into that, once we get a basis for understanding there we take general measurements of their foot. That means they’re looking at their width, whether it’s the forefoot, the heel, or even the mid-foot. How high their instep is, how high their arch length, and how much it may collapse or it doesn’t collapse because it’s relatively rigid. We take these factors to account because how much you’re able to bear weight or absorb shock that way. From there we watch the individual walk and then finally we take the individual, that walker, that runner, that athlete outside to watch them run. Using cameras we do a whole video process where we film the running up the block and down. Sometimes we do profile perspective as well so we can consider their overall alignment and posture. And we slow down that footage so that frame by frame you can understand how the individual carries their weight from one foot to the next. That gives us a better understanding of how they are able to carry their weight, or not so much. Because it’s not just looking at the foot level from behind and in front. You have to look at their hips, their shoulders, how they’re holding their head. All these things play a part of how they able to effectively absorb and withstand all of the weight and pressure that running applies because it’s a single-legged* stance. It’s a lot of weight. It’s two and a half to three times body weight shifting onto one foot. You have to make sure you can hold your weight appropriately and we got to take the analysis from there. So understanding the overall mechanics as well as understanding the shape of your foot give us a better understanding exactly which shoe is going to fit the individual. We will then recommend a few different kinds of shoe choices to help the runner find the best options given all of those factors. Dr. Segler: That’s really helpful and one of the point on this, is that it matters what your running form is right? It’s not just your foot type. There are lots of videos online that talk about your foot type. They describe in great detail. Then they say if you do that thing you need this kind of shoe. But it’s not really true. It’s not just you. It also matters what you’re going to do with it. I mean you would’ve put a 4-wheel drive tire on a Ferrari. That would not make any sense. You are not going to drive it off road. In the same vein, it matters what your foot type is and what type of run you are doing, and what type of surface you happen to run on. It matters what you’re doing. I personally run in 4 different kind of shoes depending on the run that I’m doing and the surface that I am running on. My trail shoes are great for trails. But I would never in a million years run on pavement with trail shoes. I don’t think it could run more than a couple of miles on concrete in my trail shoes without getting stress fractures in the shoes that I use for trails. That’s just because of my foot type and the way that I run. All of that really does matter right? One of things you alluded to is amount of force to apply when your running. We know that the way you run changes so I lecture to physicians about barefoot running biomechanics and running biomechanics in general. And it makes a huge difference in the way that you run. I think that when people run more as a forefoot or mid-foot strike they have a much broader range of shoes they can accommodate the running style and terrain while still getting away with it. But if you are a heel striker you’re limited more right? So if you have a flexible unstable hypermobile foot that you referred to, then you need real motion control for that right? And if you have a rigid rectus type foot then if you wear real pronation control or stability shoes you are probably going stress fractures because your foot actually has too much control right? In terms of when people have plantar fasciitis, let’s imagine someone has a fairly stable rectus foot type, not a hyper-mobile foot, but a fairly stable neutral foot with a decent arch that stays that way when they run. What are some of the shoes that you would generally recommend to them? Dawson Alexander: You might need to start off with a neutral platform because you are not necessary having to over correct that foot type because over correction can cause negative consequence. If you over correct that foot you can see some problems, if you under correct the foot you can see the problems there, too, but the problems are different. Sometimes what we want to do is help reduce what I call the “plantar loading and the weight loading” through running and sometimes that helps alleviate the symptoms that we end up experiencing in cases like plantar fasciitis. So typically we will look at a neutral base and take it from there whether it’s an Asics shoe or Mizuno shoe or something even softer than that. There are other options there, but it’s just looking for ways where we can just reduce that loading that is experienced experience through the force or through the gait cycle that seems to help them. So we have to determine whether we are working with a neutral foot type or if we are working with a foot type that is hyper-mobile, where you want to capture a lot more that motion to keep the foot more efficient when bearing weight but that’s just not the case with a much more rigid arch type. Dr. Segler: So with that rigid arch type analysis, again because every runner is different, the way they run is different, their posture is different, their foot is either wide or narrow. There are all of these components of their foot type to consider. When you consider that runner with plantar fasciitis who has a relatively neutral foot and you’re talking about a neutral shoe, with Asics for example, would you mean more the Asics Gel Nimbus or more like the Gel Kayano? What would you sort of start with? you’re trying to over correct it. But we would rather start with a more neutral like the Nimbus or the Cumulus. Brooks would be another running shoe manufacturer to consider. Or even the Mizuno Wave Rider would be another great option to check out. There are also newer unique brands out there like these point such as a brand like Hoka which introduces a lot of cushioning underneath the foot in combination with a rocker sole shape. Sometimes that rocker shape can help alleviate a lot of loading through the gait cycle. That particular shape of the forefoot sole can reduce the pressure and decrease the amount of stress on the foot when running. So will look at the couple different options there to see which running shoe fits the foot best and what feels more natural to the foot. And considering those factors can help alleviate some of that impact and pressure. Dr. Segler: It is true because there is a very broad range of options in running shoes now. Every running shoe doesn’t have a 12 millimeter drop right? So you have the whole range. You have 0mm drop all the way to a 12 mm drop or even something interesting like the Hoka, which, many people refer to it as a maximalist kind of shoe, and think of it as the opposite of a minimalist shoe. It is very soft, it is very cushy, yet because of the relatively wide stance, it is pretty stable. But then also it does have that rocker that unloads the forefoot yet, it doesn’t really have a very high heel. It looks like it gets thick but it’s a more like a minimal shoe in terms of the heel height. Because it doesn’t have a standard heel high correct? It’s a very interesting shoe. I personally run in Hokas for one of the specific weekly runs that I do. They are very interesting right? But it’s a completely different concept. Hokas can help the right person for sure. Dawson Alexander: And its understanding when to introduce the Hoka and that concept depending on the particular problem that we are working with. Dr. Segler: So what about running shoe inserts? Because I actually had a physician approach me at a medical conference one time and he said, “You actually treat all runners in your practice, is that right?” I said, “Yes, that’s true.” And he then said, “You must make a lot of custom orthotics.” And I replied, “Well, actually I make a whole lot less custom orthotics now as compared to when I had a standard practice. Because I think that most runners don’t really need custom orthotics. At least, that’s my professional opinion. Now, there are probably some podiatrists right now hearing me say this who would like to kill me. But that’s my opinion, and I stand by it. I don’t think custom orthotics are necessary for most runners. I think in most cases, if you have appropriate shoes your running style, particular running form and the surfaces that you run a pond, and you’re really paying attention to your running biomechanics, you can achieve whatever you want as a runner. Some people do need extra support. Some people do need custom orthotic support. But again my opinion is most runners do not. What is your opinion on custom orthotic as well as to over the counter inserts? Dawson Alexander: I mean the stance that a lot of us here at A Runner’s Mind take is that we try to get as much support and cushion from just the shoe itself. If we fit you appropriately then we can find most of it just within the shoe. Now there are some cases in which we do need to add that insole but typically over the counter tends to be a really easy solution for most people. But largely we try to get the bulk of the stability or the cushioning just from the shoe platform Because they are so well constructed, there’s a lot of research and development and science that goes into the construction and innovation of running footwear to provide all of that for the athlete. So largely we try to use the shoes to supply all of the support and cushioning that a runner needs. But having said that, we do carry over the counter orthotics for that runner who needs just a little bit more support or they need to adjust where the arch and heel is sitting within that shoe, depending upon the problem going on. Dr. Segler: I would imagine that some people come into the store and they have their heart set on a certain shoe for some reason, or they read something about a particular shoe in a running magazine, or whatever, and then they realize that shoe may actually not be perfect for them but maybe with and over the counter shoe insert supplementing the shoe, it makes it good enough for them. Is that accurate? Does that happen? Dawson Alexander: Sometimes that does happen but if we can steer people towards a shoe that fits then best, then that is going to be our overall goal. But yes, we do have people coming to the shop looking specifically for some certain running shoe or insoles. This often seems to be because one of their friends told them that is A shoe that they have been running in and that particular shoe has been working well for them. In other cases their doctor may have suggested it so they want to look into it but, because it doesn’t really fit their foot, it doesn’t feel right, then obviously that may not necessarily be the direction to go with that particular shoe and we do see that a lot. Dr. Segler: When people have been told that they need over the counter inserts you guys do have some here at A Runner’s Mind, right? Dr. Segler: What over the counter running shoe inserts do you recommend for patients with plantar fasciitis when they really do want them. Dawson Alexander: When they really do want them again we’re going to look at their arch type and their foot. We watch them walk. We watch them run to understand their biomechanics and we have a couple inserts they can look at. We have Superfeet of course because that’s the number one recommended in shoe insert suggested by doctors and podiatrist. But we do have others. And while another secondary insole like Currex which is a German manufacturer, that I personally run in quite a bit. In either circumstance their designed with very distinct purposes. Superfeet is all about controlling the foot mechanism. So it is a great option when there is some kind of discrepancy with the alignment that we need to control and support. Currex is based on a little bit of a different spectrum. When we understand that we need to just add a little bit of stability the running may need an insert that is designed to improve the overall foot efficiency. In that case it is not necessarily over correcting, but rather just improving some of that weight loading, that weight bearing through the course of these longer distances because the foot does fatigue. Honestly it does fatigue eventually. So the more you can reduce some with that pressure and impact, the more you can buffer some of the fatigue and then it’s going to feel a lot better at the end of the race. Dr. Segler: That brings me to another question you say the foot fatigues right? We know that fatigue happens to runners. My opinion is that most runners get injured when they get fatigued. So when our form is good were more efficient right? Everything’s working properly, forces are distributing more evenly. But when were hammered the large muscle groups are weak and failing. And so instead you have all of these little peripheral muscle groups trying to help. They are trying to make us keep moving forward. That’s when things get stressed to the point of getting an injury. So what do you think caused this plantar fasciitis in runners? Dawson Alexander: A lot of it is fatigue. It’s multiple things that can contribute to something like plantar fasciitis from the surfaces that you’re running on, improper footwear, to poor mechanics. All of these things can contribute to the development of plantar fasciitis. In some cases I might get a really neutral runner. But it’s just over-use. Its day-in and day-out. Or maybe they’re not changing the surfaces enough as they need to be. They are just running on the same path when instead they might benefit from changing it up about once a week to feel a little bit better. Or its they’re running form. Sometimes we have athletes who are a forefoot or mid-foot striker yet they have developed plantar fasciitis. It’s not really a lack of stability it’s just that they have so much vertical displacement. They’re so bouncy and they are absorbing a lot of that pressure when they bounce. If we can just help them to smooth out the form a little bit, they may feel a little bit better. There really are a lot of things that can contribute to something like plantar fasciitis. That’s what makes it tricky sometimes to diagnose the problem when a runner comes into the shop. There are just many different factors that we have to look at and identify. Dr. Segler: When you see somebody here on the A Runner’s Mind store who has plantar fasciitis and they are a runner, and they have that annoying issue where they are having those painful steps in the morning and they are pretty sure they don’t have a stress fracture, or a partial rupture of the plantar fascia or something more serious, and they want to try to do something about it at home like massage or compression or those kind of things, what is it that you think is most helpful to them? Dawson Alexander: A lot of it is the eccentric calf raises and the calf stretches as well as the massage tool; the self-therapy. It’s using things like a massage roller, whether it’s a foam roller or one of the newer options. I love the roll recovery roller, R3 roller because you can roll your foot across and get it a thorough foot massage. You can also prop it up on a yoga block and you can get into the Achilles. That Will help to alleviate some of that loading and stress that you have experienced. When you are recovering from being out there running and walking and you can use things like massage stick to get to the calves and the Achilles but the R3 really I love. Dr. Segler: So you like that better than the stick? Dawson Alexander: I do because I can get just a little bit more thorough and into the nooks and crannies and those areas in the Achilles better and really get a thorough massage of the foot deep into the arch. It’s really good for getting into the plantar fascia there. You can get into the heel too, to help break up some of that scar tissue and alleviate that soreness and that aching pain. Dr. Segler: Great! And what about compression? Dawson Alexander: I love compression. I use compression quite a bit actually both when running but more importantly through recovery. So post run, post long runs, I use it. It seems to help it kind of cool off or settle some of that inflammation and expedite that muscle recovery quite a bit. For running, I love it because I feel like it reduces some of the muscle vibration so that tends to feel a lot better. I tend to be a runner that has a lot of vertical oscillation. I feel like I am a very bouncy runner. So I just feel like reduces some of that loading from that vibration and balancing stress from the body during weight-bearing. Dr. Segler: I am a huge fan of compression. I use it all the time for recovery. I have been using it since 2008. I wear compression socks after my long run to facilitate recovery like we are talking about. I wear compression socks for 24 hours after every marathon and 48 hours (in fact I even sleep in them) after every Ironman. And although there is a lot of conflicting data whether or not it really helpful when you running, I have found them helpful. And this is not really “scientific evidence” just an anecdote, but in my fastest Ironman ever I was wearing compression socks. And I actually had trouble getting them on because it was wet, and the change tent in transition was full, so I was standing in the parking lot trying to get the compression socks on and I had a transition time that was nearly 10 minutes. That terrible transition time was partially because I had so much trouble getting into the socks. Of course, that was killing me the time, but it was my fastest race ever. But then the compression socks really help me in that race? I don’t know, but probably. I have to think it made up for some of that terrible transition time at least. But all kidding aside, compression can be very helpful. You have to do something like ice it, to reduce the inflammation or something like compression to move the inflammation out and prevent it from accumulating. 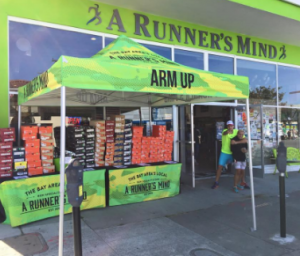 So for any of those patients who come into the store and might have plantar fasciitis I would imagine they could come to any Runner’s Mind store in the bay area to make sure they are getting an expert evaluation. You guys will actually look at their foot type, look at their running biomechanics, really assess their gait type and make sure they are using their appropriate shoe above all else right? Because that really is where it starts, that’s it, that’s the primary thing that’s between you and the ground you are running. It’s the shoe. And if you don’t have the right shoe that certainly makes it harder to achieve your running goals, I would imagine. Dawson Alexander: Absolutely. We like to think that as athletes and runners literally your only equipment, your only tool, is your shoes. So if you get that wrong and then you start to feel the consequences after a while. Dr. Segler: One piece of advice. If you have only one piece of advice for runners with plantar fasciitis, what would that be? Dawson Alexander: My advice would be active rehab. It’s doing the massage work, it’s using those foam rollers, it’s doing the calf raises, it’s doing the calf stretches, all to alleviate some of the pressure and the tightness you experience in the calf and the Achilles tendon as well. It’s rolling out the foot. Above all else really pay attention to that, but I would not say that you don’t necessarily have to stop running. I don’t think that is necessarily the best route to go depending on how bad the symptoms are. Many runners can run through it but at a moderate amount, if they are doing this kind of self-therapy. Dr. Segler: Well there you go! Dawson and I agree… runners don’t always have to stop running when you have heel pain, particularly if it’s plantar fasciitis. You just have to make sure you are really doing all these things Dawson talked about. You have to make sure you have the right shoe. You have to make sure that you really assess where you run. You have to assess your running biomechanics and the things that you can do to moderate the forces applied to the plantar fascia so you can keep running, achieve your goals and run as much as possible. «« Ironman Champion Felicity Joyce on the power of mindset in racing, coaching and getting back to racing shape after injury.